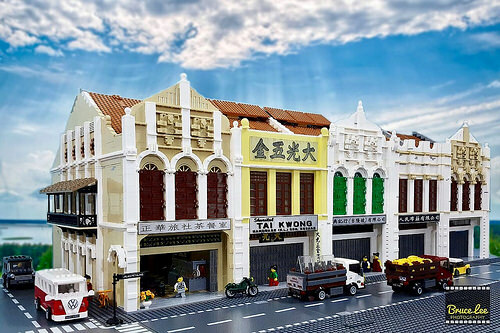 Builder Vincent Kiew recreates a faithful representation of a row of shophouses in Petaling Street in Kuala Lumpur, Malaysia. The little street has been the bustling heart of the city’s Chinatown since the late 19th century, and these buildings still stand today, preserved and maintained for future generations. I’ve visited the street in real life myself, and it really is quite a sight to see. 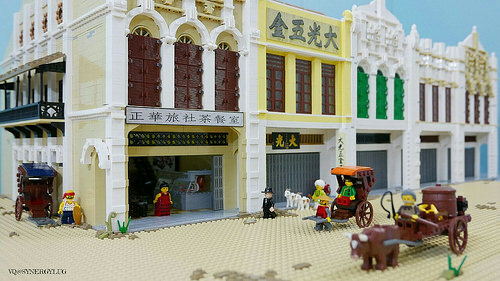 This LEGO scene is accurate right down to the little details, such as the open-top trucks and the store signage. Vincent has also built a version of the street depicting it in an earlier time, when mud and cobbles would have been home to horse-drawn carts.